On Tuesday, July 21st, Indigo welcomes LED ZEPPELIN guitarist Jimmy Page to its Bay & Bloor location (55 Bloor Street West) in Toronto. 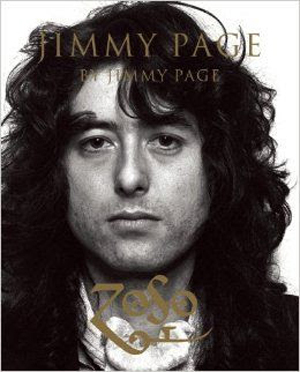 Page will stamp copies of his photographic autobiography, Jimmy Page by Jimmy Page. An exploration of a legendary career through significant photos and extended captions, this book is a definitive visual record of a remarkable life of music. Event: 3:00 p.m. - 4:30 p.m.
For complete event guidelines and information go HERE. Jimmy has sifted through thousands of prints to accomplish the final selection of photographs, arranging the content into its narrative sequence and annotating and reviewing the design to arrive at the finished book. "I always like to do something different," says Page. "If you’re inspired by an idea, really make something of that inspiration. That goes for music, as well as anything else – even putting a book together! To have a photographic autobiography is a totally different way of looking at things, but it does the job very well and I think it will bring a lot of pleasure to people." With incredible attention to detail, Jimmy Page has chosen photographs representing the most significant moments in his career: from a schoolboy with a rock-a-billy quiff through his extensive work as a session musician; from THE YARDBIRDS through LED ZEPPELIN, ARMS, THE FIRM, OUTRIDER, COVERDALE & PAGE and PAGE & PLANT; playing with Roy Harper and THE BLACK CROWES; collaborating with P. Diddy and performing with Leona Lewis at the closing ceremony of the 2008 Beijing Olympics. Jimmy Page By Jimmy Page collects together hundreds of photographs to present the complete visual narrative of a remarkable career in music. The publishers, Genesis Publications, and Jimmy Page have sifted through thousands of photographs to produce a final and definitive edit that includes a mixture of iconic portraits, rare and unseen images and photographs from Jimmy’s own archive. The collection represents the work of more than 70 different photographers including some of the greatest names in rock photography – Ross Halfin, Kate Simon, Gered Mankowitz, Neal Preston, Dominique Tarlé, Pennie Smith, Jim Marshall and Jean Pierre Leloir to name but a few. Jimmy Page has officially put pen to paper about his career in this expansive edition. His words take the form of extended captions, which describe and document pivotal moments and events. He has also included visas, photos and stamps from his own passports. Jimmy's own words, combined with his hand-picked photographic selection make this book an historical document and a definitive visual record of a remarkable life of music. Page adds: "I thought it would be quite interesting to do a photographic autobiography. It’s the story of a kid who’s involved with music, but really the music involved itself with him. It’s this conjoining of music and a teenager, and off it goes. I wanted to make it as thorough as possible, so that meant trawling through all the thousands of files that photographers had taken, and pulling from my personal collection as well. There’s a photo of me playing the guitar by the fire at Bron-Yr-Aur cottage. It’s the most complete document that there’s ever going to be because of the amount of time that I’ve put into every aspect."